The start to the year has been a busy one, no chance to ease back into the swing of things! Meetings are planned this week with a new client in Midhurst, Surrey to review concept plans for their tricky shaped plot, an elongated triangle with some steep level changes, also presentation meetings to discuss final masterplans in Otford, Kent. Closer to the studio in Wanstead we planted numerous specimen trees just in time for Christmas and this project continues to be constructed alongside works to the house with some exciting bespoke features to come as the year progresses. On the drawing board we are designing the planting for a semi mature garden in Wheathampstead, Herts where the garden will be overhauled to include a new bespoke pergola and kitchen, water features and topiary terrace. If you are planning a new garden design in 2018 we’d love to hear from you to discuss your ideas and see if we can help. What will be the trends be in garden design for 2018? The Society of garden designers asked some prominent members of the SGD to give their thoughts and we were delighted to be included in their discussion topic. From themes and materials to plants and planting see what you should be planning for the year ahead. The first Crocus of the season have finally appeared, this diminutive bulb is Crocus tommasinianus. Planted in small drifts through this front garden between perennials and grasses they will naturalise and increase year on year. Their soft mauve colour stands out beautifully in the soft winter light. The awards season continued this month with the Society of Garden Designers Awards 2016. We were honoured to be shortlisted for two awards, both for our Richmond Park Garden Design. The first category was Medium Residential Garden Design. Those of you who are regular visitors to our site or follow us on Twitter and Instagram will know that this is a contemporary family garden we completed in 2015. It was focused around socialising and entertaining while keeping the family at the heart of the design. Unfortunately we did not win this time, we were runner up in the Medium Residential category with the award going to one of the top garden designers in the country, Andy Sturgeon, for a fantastic project in Sussex. We were delighted to have been shortlisted in the awards and considered against such a high standard of designers in the industry. We were thrilled to design a BALI Award winning garden this year and even more so to find that the project had won the prestigious Principle Award on the night (well afternoon) at THE BALI NATIONAL LANDSCAPE AWARDS 2016. As a guest of natural stone supplier CED we enjoyed a glittering afternoon at the awards ceremony held at Grosvenor House, Park Lane, London. 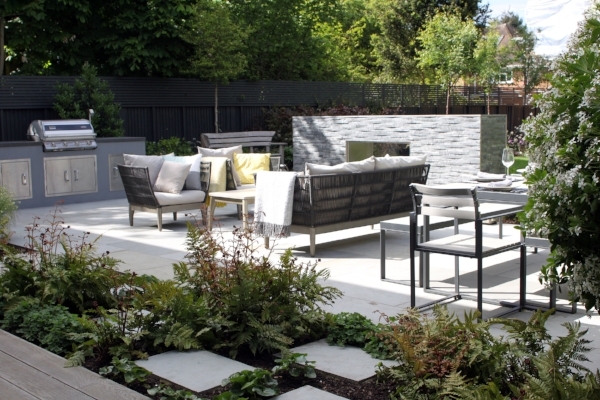 Our project 'A Private Residence in Richmond' was constructed by Landscaping Solutions and it is a testament to their skills in construction that the project was so highly rewarded. The design was created for a young professional couple and their two children as a space for entertaining but also for the family to spend time together. Bespoke elements include a steel pergola with hanging chair by Raw Studio and a beautiful bioethanol stone clad fireplace. Hedges were used to dissect the garden, screen studio gym equipment, a sunken trampoline and even a small putting green. The clients love their new garden and I am very proud to have designed this award winning garden design. We have just completed this years spring and summer bulb orders and are looking forward to receiving hundreds of bulbs ready for planting. If you haven't considered bulbs for your garden yet there is still time but don't wait too long as many require a period of cold before flowering. Here are a few of our favourites that we will be planting to provide additional colour and interest in our clients gardens for spring 17. One of the best spring flowering Crocus, providing early interest from Feb-March. Small cup shaped pale silver-lilac flowers shine out to lift spirits during the cold and darker months. Plant in poor to moderately fertile, gritty soil in full sun. Another small but striking flower to provide colour early in the year. Flowering in February their deep violet-blue flowers with yellow throats are beautiful standing out against bare soil or the buff remains of herbaceous perennials. Plant in moderately fertile soil in full sun to dappled shade. A beautiful multi-headded pure white daffodil with a delicate stature and soft fragrance making it perfect for picking for the house as well as enjoying in the garden. Plant in any moderately fertile soil with good drainage and keep moist during the growing season. A very early daffodil that can bring colour to the garden as early as December or January. We are planting this variety in front gardens to enjoy on those long dark days and bring an early sense of springs arrival. Plant in any good garden soil. A rich deep violet-burgundy Tulip with delicate elongtated petals that looks particularly striking drifted through perennial grasses. Plant in full sun in moderately fertile soil with good drainage. This deep purple almost black tulip is always popular with clients and is requested each year. Often planted with white Tulips to create a black and white affect, we love to plant them in dense groups with other deep rich tones to create a striking display in May. As always our top tip is to plant bulbs in large sweeps to create impact. Gently toss bulbs into the air and plant them where they land for the most natural feel. It's also a good idea to repeat bulbs across the garden where conditions allow to proide a rhythm in the planting. We are delighted to announce that we have been shortlisted in the SGD Awards 2016 with our Richmond Park Garden Design. The Society of Garden Designers Awards are the pinnacle for garden design in the UK, the SGD being the only professional body representing garden designers in the country. We are proud to be a full accredited member of the society having passed their rigorous adjudication process. The garden was designed for a young family with the brief to create a social space for entertaining and family play. We focused the design around a large terrace with a central fireplace and space for cooking and dining. At the end of the garden a pergola with hanging chair was placed to catch the evening sun and the clients garden studio/gym was softened into the garden with planting to discreetly screen the equipment inside. For the children a large trampoline was sunk into the space and there was also room to squeeze in a putting green for dad! As well as the main awards the garden has been shortlisted in the Peoples Choice Awards and you can vote for us by visiting the SGD Awards website and selecting the RICHMOND PARK GARDEN project this will take you through to the voting page. Wish us luck and please don't forget to vote for us! The monthly updates are proving harder to achieve than I had anticipated, just three months behind at the moment! But I'm here to update you on everything that's been happening with us this summer. We completed primary construction at our Wanstead Courtyard Garden Design and planting has been installed, the project includes a bespoke pergola and this was commissioned after the main hardscape to ensure the perfect fit. I am a stickler for detail and a few centremeters out would have left me twitchy. Luckily our client has the same keen sense of detail and was willing to wait just a little longer to achieve the perfect finished garden. Our Wanstead new build is currently going through planning approval and we hope to be moving forward with the next stage of design drawings soon. 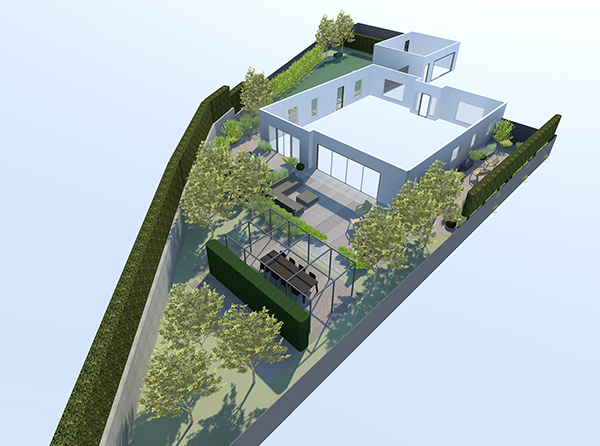 In Royston, Herts we are working with the clients on the concept designs including a masterplan for the main garden and detailed planning for their courtyard garden which leads from a contemporary extension, currently under construction. It's an exciting project with a gorgeous palette of materials and creative ideas for bespoke fabrication. Surveys have been carried out in St Albans and we are starting the concept design drawings with lots of ideas spinning at the moment. Always the best part of our job! In Brentwood the project has just gone to tender and we are completing a beautiful planting design with a palette of lime and blue in spring followed by fuchsia pink and purple as the weather hots up. Scented plants and Roses provide a modern romantic feel. We are pleased to have been commissioned for a new project in Harpenden and have been busy attending to autumn enquiries with recent consultations carried out in Wanstead and Hampstead. To start our autumn season with a bang we were thrilled to be announced as a finalist in the SGD Awards 2016 with our Richmond Park Garden (below). More to follow on this soon and how you can help by voting for us in the Peoples Choice award with Homes & Garden Magazine.